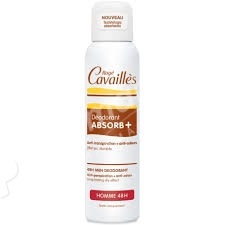 Research Rogé Cavaillès with developped at the point its first range of deodorants, especially conceived for the Men, which gives finally right to the total effectiveness to the most sensitive skins. Hypoallergenic.Tolerance clinically tested by dermatologists on sensitive skin. Hold 15cm from the underarms and spray. Butane, Isobutane, Propane, Cyclomethicone, Aluminium Sesquichlorhydrate, Caprylic/Capric Triglyceride, Parfum (Fragrance), Glycerin, Tocopheryl Acetate, PEG-6 Caprylic/Capric Glycerides, Stearalkonium Bentonite, Propylene Carbonate, Talc.